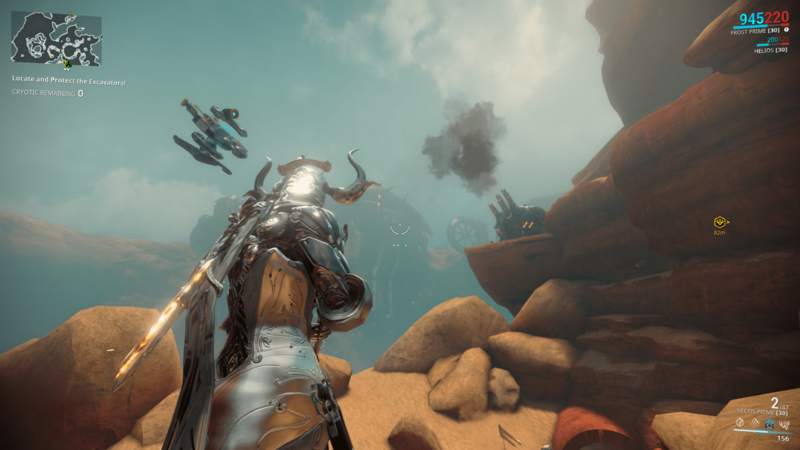 First, I promised Bhagpuss I would try and get some outside shots of Warframe. There is no first person view for screenshots that I am aware of and unfortunately my WF takes up a big chunk of the screen. I am also not great at acreenshots (both remembering to take them in the first place, and the skill of taking them) but here are a couple beautiful, industrial vistas on Mars. Property prices are very reasonable here. I’ll try better next time. Warframe has a daily login reward and everything I have received has been very useful. Right below the reward it has a line of text saying “next Milestone reward in X days” and I am working on my first, which is 50 days of logging in. I have barely scratched the surface. Curious as to what those are and when you get them I meditated on my Google-Fu. I was both shocked and amused simultaneously when I saw the Milestones. 700 Days? Really? Wow. What can be so cool that it is worth logging in for for 700 days? A sword AND shield? Maybe that is worth it. See you July 20, 2019, give or take the days I miss from now until then. I don’t think it will be many. Humour (yes, that was what that was) aside – I want that. Today though, I mean, I would pay real money for it. It’s completely wicked. I am not sure if there are other sword and shield combinations but I really hope there are. I have never really been a big fan of login rewards and gating something so cool behind so many days is something I can dislike and get behind at the same time. It is a true testament and reward for someone who has been there for years, supporting the game and being a part of the community. That is something that should be more celebrated in games in general – but more so around ones that are built around communities. The only dislike is pretty personal, that I really want it (now) and won’t have one for two years (take my money please). I’ll survive. The only downside for me is that daily login rewards should have some sort of event completion tied to it, so that you actually played. I spent more days logging into Fortnite to get my rewards than playing that game. 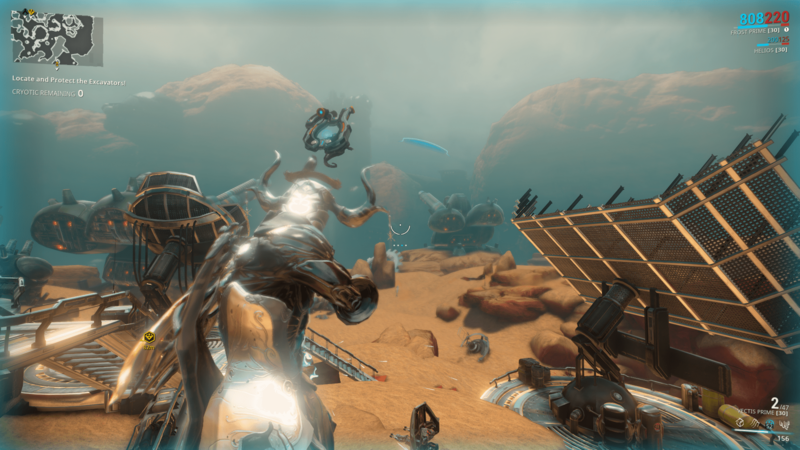 I am getting behind this decision and hope Digital Extremes stick their guns – people are already complaining about it on Reddit. Meanwhile, if I get the pleasure of seeing a player with this I will simply bow in envy and appreciation. I was pleasantly surprised to find out that there was a deal with Twitch for some neat rewards. The other day I logged in on PS4 to find various emails, and one was for free access to Frost Prime plus some weapons, but you had to sign up for Twitch Premium or whatever it’s called. Another nice surprise was that as an Amazon Prime member, Twitch Premium is included, so I didn’t have to do anything outside of linking my Warframe/Amazon/Twitch accounts and bam – free loot! The new WF is lightyears ahead of the one I was using, and the new weapons gave me a big boost. Now the problem is figuring out what the hell I was doing the last time I played. It seems that the Plains expansion is coming to PS4 this month, so I will be able to access that eventually, but in the meantime there’s a whole universe to explore. I’m currently on Mercury, but don’t even remember what planet we started on. I played a few missions and called it a night. Tempted to start over but I know I already claimed a bunch of stuff on the account so I don’t want to lose that either. Maybe I should look on a wiki? Found any beginner’s guides or invaluable sources of information yet? Best thing from all I have read (and asked and find out) is to fill out your star chart. You will know what planet you left last time because there will be locked missions. Do them, open all the jump gates, unlock every mission and planet. That should take your some time – I’m not even half way there and am pushing 40 hours. You get mastery level by leveling things up and I always have at least one thing on the go. That way I’m not gimped (ie: Max primary, leveling secondary and melee, Max frame). Just having them on missions le Berks them even if your aren’t using them. This is a game I’ll put well over 100 hours in – I already know that. Have enough blueprints for my 5th and 6th frame but need to farm mats. Every Warframe is like a new character experience in a MMO but you can transfer over your weapons and sides so it’s not stressing at square one. Finally, for change of pace run the rift missions when you get Liths to unlock more Prime blueprints. In a good group people will chain run them for awesome loot and XP. Bonus if you can choose to copy their rift reward is yours is a duplicate. Also sub the story missions which give Warframes and nice the plot along. You have to to unlock the jump gates anyway. In almost done Limbo which gives a new frame. I’m a noob still but the wikia is gold. Good to know on all accounts. I ended up reading Jeromai’s post after this one and got some other helpful tips that way. Apparently we started on earth so I did some missions… I knew I played it a bit but wasn’t sure just how much. It is a little bit of its own world and language but having the gaming pedigree I have, it hasn’t been too discouraging to figure out. I’ve enjoyed my time thus far!